No, I'm not interested in this period . . . heck, I already have far too many periods that I'm invested in. 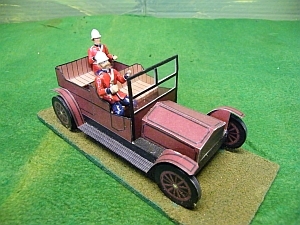 But while visiting The Virtual Armchair General's website I came across a section of 54mm scale cars, wagons and boats that can be built from inexpensive .pdf files . . . and I thought that those who are interested in this period might like to take a look at them. To me they look pretty darn good. Here is the URL of the section on them (click). Jeff can ask after your health while I am here this morning? I am doing better, sir. I still have very little stamina but it has certainly improved since the days of chemotherapy. My mouth seems to be healing well from all those extractions . . . but I will be limited to "soft foods" only for a number of months (with no upper teeth remaining and only a few lower it is impossible to chew). Still it is nice to be past all of those abscessed teeth; and overall I'm certainly feeling perkier . . . although I still do tire quickly. Nevertheless I am able to do more and more every few weeks . . . even if I still feel like a wimp at times. And I need to remember that I was a total invalid for over a year . . . and one loses a lot of muscle mass that way. Equally good to hear you're on the mend.